When you click on the link to view the video teaching, you will be redirected to another website for viewing. In order to fit more videos on the site, we had to convert the files into a smaller frame size. The website that hosts the files, converts the file again to play in their video player. You may download our original, better quality video from that website by scrolling down to the bottom of that particular video's viewing page and looking on the right side. To download, you may need to create a free account on that website. While I was in Trinidad back in 2003, when I walked into a Radio Shack, the Lord spoke to me that I was going to put my foundational teaching on DVD and it would be used in Russia. I wasn't even in Russia! We moved to Russia in 2005. 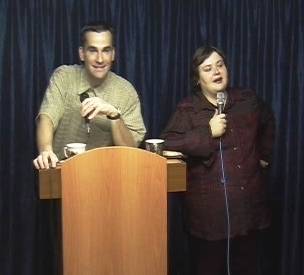 These lessons are part of a foundational series that was taught in the bible school in Ufa, Russia during the 2005-2006 year. Recently, my pastor friend in Ufa, Russia decided to show the DVD bible school in his prison ministry to see what results it might produce. He began with this foundational series and he said that after the first lesson (a lesson that explains why we need Jesus), all prisoners, around 70, asked to receive Jesus. This is a testament to the power of the Word being seed that produces when it is planted in the heart. At a friend's request, the first three lessons are available.